Toucans are primarily fruit-eaters, preferring the darkest, so ripest, fruit. Their long bill allows them to perch on heavier, stable branches and reach a distance for hanging fruits. They snip the fruit off, hold it at the tip of the bill, and then, with a forward flip of the head, toss the fruit into the air and into their throats. Small fruit seeds pass unharmed through toucan digestive tracts and large seeds are regurgitated, also unharmed. Thus, these frugivores aid in the dispersal of tree seeds, and, together with other fruit-eaters, are responsible for the positions of some forest trees. Breeding is during the dry season. Toucans nest (and some sleep) in tree cavities, either natural ones or those hollowed out by woodpeckers, in either live or dead trees. Nests can be any height above the ground, 100 ft or more. Both sexes incubate and feed the 2 to 4 young. Toucans are apparently monogamous. Some species, such as the Collared Aracari, seem to breed cooperatively; that is, other family members, in addition to the mother and father, help raise the young in a single nest. No other word fits them - toucans are spectacular animals. Their shape, brilliant coloring, and tropical quintessence make them one of the most popular "poster animals" for the tropical forests of the Americas and one most visitors want to see. It's hardly surprising, therefore, that the logos of several conservation organizations and tour companies feature toucans. The toucan family, Ramphastidae, is classified with the woodpeckers, and contains about 40 species - the toucans and the usually smaller toucanets and aracaris (AH-rah-SAH-reez); all are restricted to the American tropics. Six species occur in Costa Rica. The first sighting of toucans in the wild is always exhilarating - the large size of the bird, the bright colors, the enormous, almost cartoonish bill. Toucans are usually first noticed flying from treetop to treetop in small groups. The bird's most distinguishing feature - its colorful, disproportionately large bill - is actually light, mostly hollow, and used for cutting down and manipulating the diet staple, tree fruit. Toucans are gregarious forest birds, usually observed in flocks of 3 to 12. They follow each other in strings from one tree to another, usually staying in the high canopy (a toucan only occasionally flies down to feed at shrubs, or to pluck a snake or a lizard from the forest floor). The birds are playful, grasping each other's bills in apparent contests, and tossing fruit to each other. Sometimes individual fruit trees are defended by a mated toucan pair from other toucans or from other frugivorous birds - defended by threat displays and even, against other toucans, by bill clashes. Chestnut Mandibled toucans, the largest in Costa Rica, may "parasitize" the slightly smaller Keel-Billed Toucan. The larger bird follows the smaller, then chases the smaller away after it succeeds at locating a fruit-filled tree. Toucans are frugivores, so they eat mostly fruits and nuts. However, they occasionally snack on insects and small lizards, too. What are the predators of toucans? Snakes and lizards often raid bird nests. Birds of prey, such as eagles and hawks, are predators of many species of birds. Felines, such as jaguars and margays, will also eat a toucan. How do toucans protect or defend themselves? They nest and sleep in hollow tree holes, which protects them from hunters and stalkers. Toucans in a group will often set up a raucous chorus of noise whenever a predator is near the flock. In what rainforest layer do toucans live? Toucans live in the canopy layer, high in the trees, where they can build nests and protect their young from understory and forest floor predators. 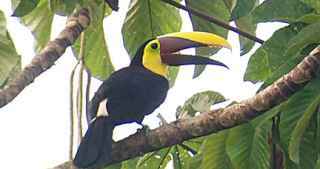 What is the toucans contribution to its ecosystem? Toucans spread fruit seeds ! They eat the fruit, and the seeds pass through their stomachs unharmed. In other words, many forest trees do not grow under a parent tree, but grow where birds drop the seeds.